In Swiss vernacular, Bern is pronounced as “Barn”, which translates to bear. An obvious association, since the bear is featured on Switzerland’s coat of arms and is treated as the country’s national animal. Stories say that the city was named after animal that was slayed in the surrounding forest area. The love for bears becomes apparent in this park. Housing live bears in 1513, the Bear Park is a well-loved and rather popular place. 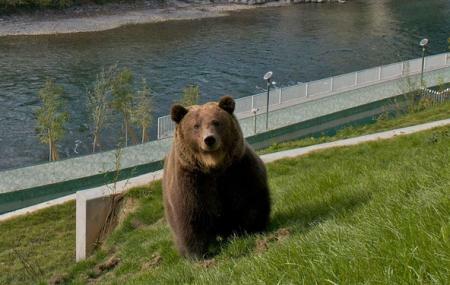 The beautiful park built on the sloped alongside the Aare River, where the bears can play, take a swim, climb trees, adds to ambience of the park. The bears also have their own caves, should they desire privacy! If there’s ever a crash course you need on bears, the Bear Park is where you should be headed to. How popular is Bear Park? People normally club together Old Town Bern and Cathedral At Munsterplatz while planning their visit to Bear Park. People also prefer to start their day with Bear Park. 3rd time visiting Bern and it was a dry day, last two visits It was ☔ .....saw 3 of the bears out enjoying the sun. Glad they have a good space and pool in the enclosure. Although I still feel wild animals should be free in their natural habitat. Only place, where one can see gaint bears (🐻) right in the heart of city, without going to zoo. Loved the way authorities have made it without restricting their space. There is a beautiful river flowing by where these bears can be seen playing in summers. The best time to visit and expect to see bears is in Summers. We reached around 9 in the morning, it was nice to see all 3 bears of the bear park. The place has a wonderful view of the city. I visited in winter and very cold. So that I couldn't see bear. Next time I wanna come again in warm weather. The houses nearby are historical and good to see though. Awesome place to see the Bears. The enclosure seems pretty natural and open for them so they don't feel trapped.